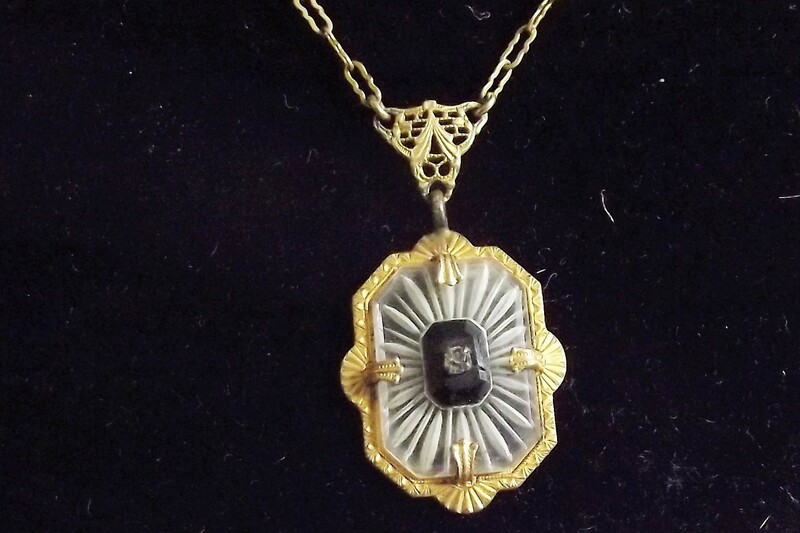 Recently I sold this fine Art Deco pendant online for $164. The pendant itself measured 3/4-inch square, and the ornate emerald cut camphor glass and onyx center had quite a beautiful intricate design. In the center was a tiny pronged in diamond (could be a crystal). The gold ornate setting and chain, unfortunately, were void of any gold purity hallmarks, but it appeared to be gold…I didn’t see any tarnish on it and the piece held some weight to it. Puzzling because the clasp seemed to be Victorian in nature and had shown some wear to the gold; it could be vermeil (gold coating over sterling). I listed the pendant for sale online stating that I wasn’t sure of the gold content. I sold the piece for a fairly decent price, but I probably could have received more for the necklace, had I found any hallmarks or markings or clues of its gold contents. Jewelry made in America during the Victorian, and Edwardian Eras may be void of any identifying marks. This is why it’s a good idea to invest in an accurate gold tester and a jeweler’s magnifying loop. The pendant may not be marked, but the original necklace that came with the pendant may have a mark of 9k, 10k, or 14K on the clasp. If you’re lucky enough to find English-made Victorian pieces with their gold purity marked, you could sell a piece for over a $1,000+. This exquisite filigree Victorian piece pictured below, recently listed on Etsy.com with an asking price of $2,200. Key-It is made of 14K white gold and has tiny diamonds and sapphires. Research is everything! I paid $5 for the piece I sold online, and I made a decent $150 profit! 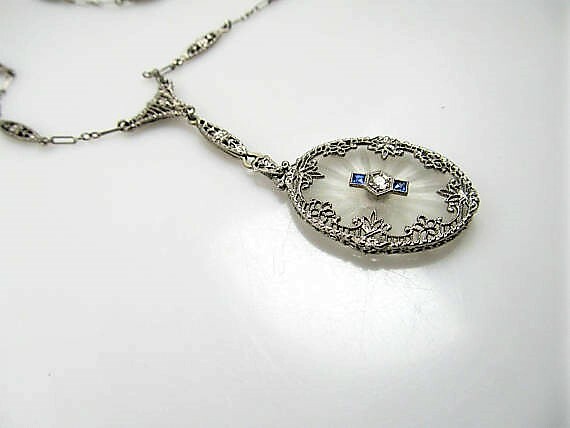 If you find any intricate/fine looking necklaces selling for under $20, and they appear to be antique-TAKE A CHANCE, you may have found a real treasure!